Green Arrow has convinced the Police Chief of Seattle of his innocence but The Vice Squad is still at large, along with Merlyn - The Dark Archer! Thankfully, Oliver Queen's half-sister Emiko - now calling herself Red Arrow - has returned to lend a hand. Can one good cop and all of Team Arrow save the city? 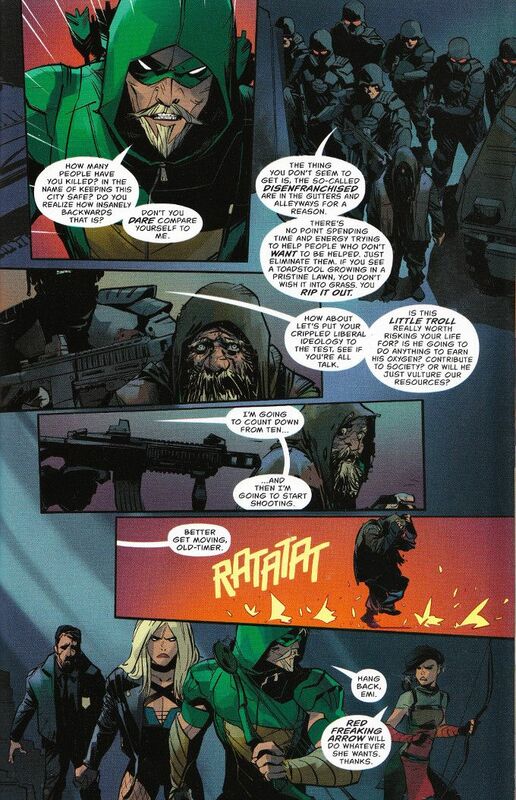 There's a lot going on in Green Arrow #16 and most of it is good. Benjamin Percy balances the various subplots like a master plate-spinner. Of particular note is the development of the relationship between Oliver Queen and his sister, Emiko. 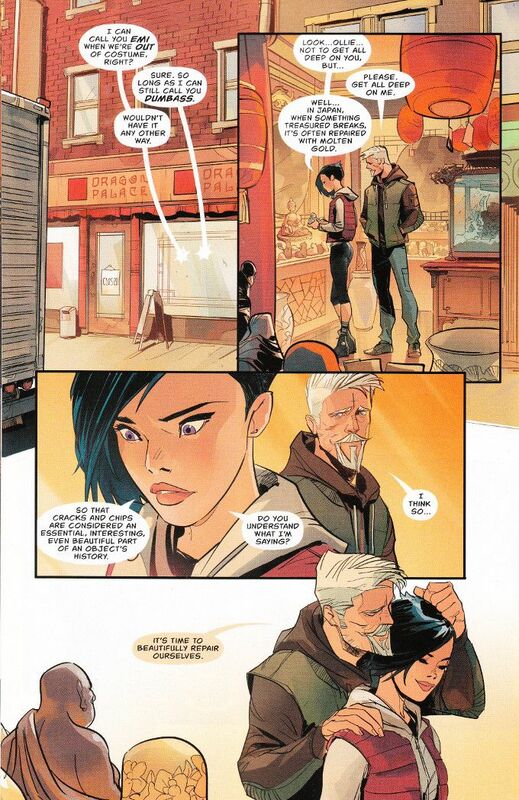 When she was first introduced by Jeff Lemire, Emiko seemed like little more than a bargain-basement Damian Wayne. Percy has developed her into her own character, while still retaining the base idea of a snarky teenage girl who gives Ollie hell in a loving fashion. The kinetic script is well-matched by Otto Schmidt's artwork. There is a sense of motion to every panel of this comic - even the scenes that just involve two characters talking! The colors are all well chosen and I'll be stunned if Schmidt doesn't get nominated for an Eisner this year. The fast pace does prove detrimental in one respect. Some of the subplots - such as the one involving The Vice Squad - are settled with far more finality than seems appropriate. Another problem is that Black Canary has little to do in this issue and thus far John Diggle only seems to be in the book as a hook for Arrow fans. While Percy has already shot down my dreams of Felicity Smoak stepping in to replace the cliche hacker character of Fyff (also brought over from Lemire's run), I would still like to see more of the ensemble in action.